Lou Gramm has been at it for over five decades. During that time he has seen it all and then some. 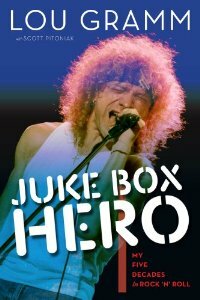 He has had his share of highs such as being in an ultra successful band as Foreigner as well a successful solo career. To accompany those highs, one must also experience lows and Lou has had his share but it helps keep him even keeled. The book is an excellent read how the Rochester, NY native started out as he takes you back through the decades. He talks about where the tension between him and Foreigner guitarist Mick Jones first came into fruition. He also talks about the very beginnings of how Foreigner came about as well as his solo career and his first major band Black Sheep amnd everything between. Lou Gramm has endured quite a bit over his tenure. The benign brain tumor came at a point in his life where he should have been hitting his prime as a singer, songwriter and performer. It has taken Lou a long time to recover from his medical issues as they affected his stamina as well as his voice. This book will take you through the trial and tribulations that saw Lou overcome all the hurdles and obstacles to get him back on stage doing what he does best.